Why Does the Sun Look So Weird and Beautiful In this Photo? This is a solar eclipse. 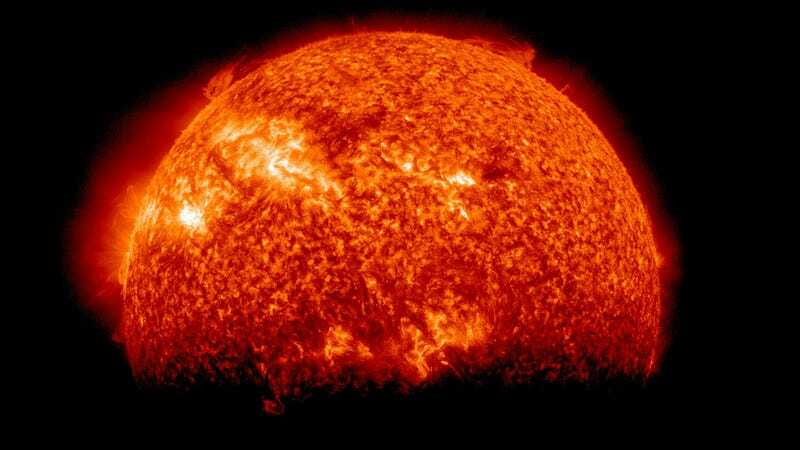 One like you have probably never seen before, taken by NASA's Solar Dynamic Observatory in space. It looks really weird, as if the Sun is fizzling away, fading into the darkness of space. Why is the edge of the shadow fuzzy? Every six months, SDO goes into what NASA calls an "eclipse season." For more than an hour a day, the spacecraft goes behind the Earth. So what you are seeing here is not a typical solar eclipse, where the Sun hides behind Moon. Here it's hiding behind Earth, with more than half still out of our planet's silhouette. That's why the edge is fuzzy and convoluted in such a strange way: Earth's contour is distorted by our atmosphere, something that the Moon doesn't have.